A few weeks ago, I bought a 2001 Oldsmobile Alero for $1 from a friend who just wanted the non-running junker out of her driveway. My plan was to destroy the car in an upcoming video series, but those plans have now changed; I’ve decided to trade the N-Body sedan for a ruined 2003 Kia Rio. 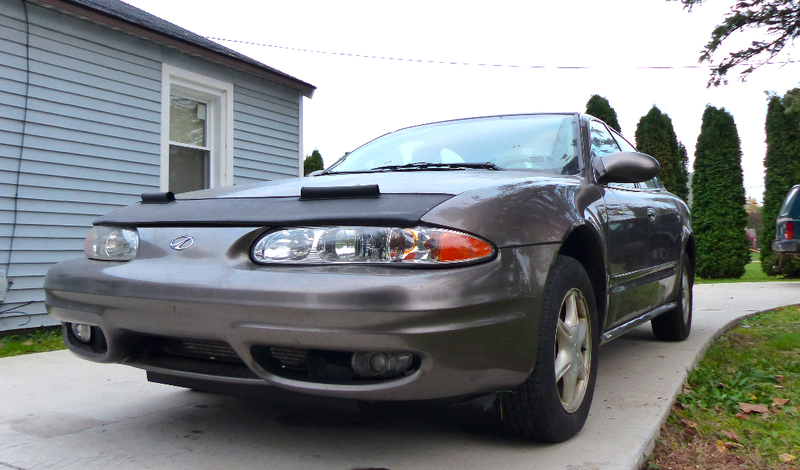 I have been having trouble sleeping at night ever since I got my $1 Oldsmobile Alero’s Twin-Cam 2.4-liter inline-four purring like a kitten. Sure, none of the car’s gauges work, and the transmission cooler still leaks like a sieve, but the powertrain and body are solid, the interior is in great shape, and the suspension makes this old GM mid-size sedan glide down the road like a magic carpet. As I said in my other article, ever since I took that trip to the junkyard to replace the $1 Olds’ faulty ignition parts, the car has officially been the nicest car in David Tracy’s Automobile Shelter For Misfit Machines™. And it’s for that reason that I cannot bear to destroy it in our top-secret new video series. Instead, I will trade the Alero to my neighbor/landlord, who recently rammed into the back of an SUV with his 2003 Kia Rio. At first, my plan was to help my neighbor fix his car by replacing some non-structural sheetmetal, as he told me his mechanic—who did not open the hood, for fear that it may not close again—had ordered a fender, grille, hood and headlight, all in black primer for about $1,000. “Forget that,” I told my neighbor, “Just go buy these parts from the junkyard; it will save you a bundle.” So he called up his shop to cancel the order, and joined me on a trip to our local yard—U.S. Auto Parts in Sterling Heights, Michigan. As the place closes at 6 P.M. and we had arrived at five, we spent exactly one hour frantically removing the hood, fender, headlight, and grille off of the green Kia Rio in the picture above. The radiator support on the driver’s side was pushed back about five inches. The radiator hose was crumpled up, severely restricting coolant flow, and the radiator fan was pushed all the way back against the motor. There was no way the fender, headlight, hood or grille would fit with that busted radiator support. And even if we did use a strap and a tree to try to pull that crossmember back out, we’d be hard-pressed to ever get it quite perfect. “To be honest, this car may be totaled,” I told my landlord. (A subsequent survey to some of my Twitter followers confirmed this, with my favorite reply being: “Yes. New tires and a battery would total a 2003 Kia Rio.”). All kidding aside, I don’t think it’s worth my landlord trying to get this thing mended, even if he did buy the car new in 2003, and even though the car does still drive (without overheating). That’s why I figured it would make sense to trade him the Oldsmobile. This transmission cooler fitting is leaking. I’ve already replaced the line, so it seems the problem is the fitting on the radiator. The only problem with that is, now I have to fix everything wrong with the $1 Olds, and I can’t take shortcuts. That leaky transmission cooler, for example: I can’t just grab a cooler from the junkyard, and ziptie it to the grille like I had planned. I have to actually buy a new radiator (they’re only $45, so that’s not a huge deal). Plus, I think I need to get those gauges going—my neighbors aren’t going to want to drive a car without gauges. Nonetheless, I think this is the right thing to do, not just for my landlord, but also for car culture. The Alero is at least a somewhat decent automobile with a few pretty curves and an acceptable amount of power. The Kia Rio is just a sad little little crap-can that deserves to be recycled so that a better car can be made from its scraps. Whether the little Kia will make the 700 mile trip to North Carolina (where we’ll be filming), only the car gods know. Either way, something tells me it’s going to be an interesting drive.